You can buy a copy of Yamuna Devi's award-winning cookbook Lord Krishna's Cuisine, or you can simply visit Gandhi Cuisine of India. There's a reason Tucsonans choose this place year after year as their favorite Indian restaurant: The food is superb. A sense of peace washes over you when you walk in the door. The wizened visage of Gandhi himself, sporting a halo, looks down upon you as you're seated at the table. Order some sweet mango juice. Indulge in a couple of veggie samosas. 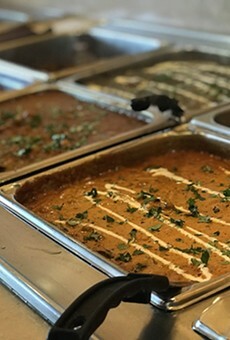 After that, try one of the vegetarian specials, perhaps something from the curry pot or the tandoor, or one of their special dinners for two—and don't forget to order some tasty naan.